I’ve spent all day trying to compile the list of delegates that are going to the Republican National Convention. With 99 precincts reporting as of 5:39 p.m., I think I’ve got the list down. Trump won 30 pledged delegates from West Virginia. That’s 88 percent of the delegates in a state where he won 77 percent of the vote. He was guaranteed the three RNC delegates-Conrad Lucas, Melody Potter and Kris Warner-when he won the popular vote. District 1: Barry Bledsoe, Mary Beth Andreini and Phil Mallow. District 2 (97 percent reporting): Vic Sprouse, Mike Stuart and Ron Walters. Trump won 18 out of 22 at-large delegates. Two of the uncommitted delegates have verbally pledged their support to Trump, according to Mike Stuart, the co-chair of Donald Trump’s West Virginia campaign, but they aren’t bound to vote for him. Morrisey hasn’t endorsed Trump yet and Katrina Lewis couldn’t be reached for comment, but pledged her support to Kasich in January. We’re still waiting on a few more precincts to report in District 2, but I don’t see an awful lot changing with that vote. If anything, the only thing that might happen is Mitch Carmichael may get knocked out and Bob Adams may get in if there’s a precinct that went heavily for Cruz. Trump would have won all 34 delegates if it weren’t for some rules that were put in place before the 2016 primary that limited delegates based on where they live. There will be a story about this in Friday’s paper, but here’s the rule. That’s why there’s a Kasich supporter with way less votes than everyone else on my list. Lewis was actually the 60th overall and 10th in CD 1. If you want to see the vote totals in order, for both at-large and congressional districts, here’s my spreadsheet that I used to sort through all of this. The first 22 names are in bold because those are the people who would have made the convention had the geographic rules not been in place. The people who are eliminated are in red. I only put in the county and districts for the top 75. I’ll update the story when the AP comes in with their final numbers. Yesterday I wrote an article about how increasing and decreasing property tax values have resulted in classification changes for 17 counties. The classification system doesn’t mean much beyond how much the elected officials in the counties earn, but they are calculated based on something more important—property tax values. Counties rely on property taxes for their income, it’s easily their largest source. So you can get a bit of an idea of how a county is doing, based on whether or not property taxes are increasing or decreasing. Only 10 out of 55 counties saw decreasing property tax over the last two years, and a major contributor to that is the decline of the coal industry. As mines have left or gone bankrupt, they’ve taken equipment and businesses with them, and since those are taxed, these counties see a decline in property tax values. When I was talking to Sam Rogers, a county commissioner from Ritchie County, he mentioned that the biggest reason his county moved up three classifications was because of the oil and gas industry, particularly the marcellus shale. 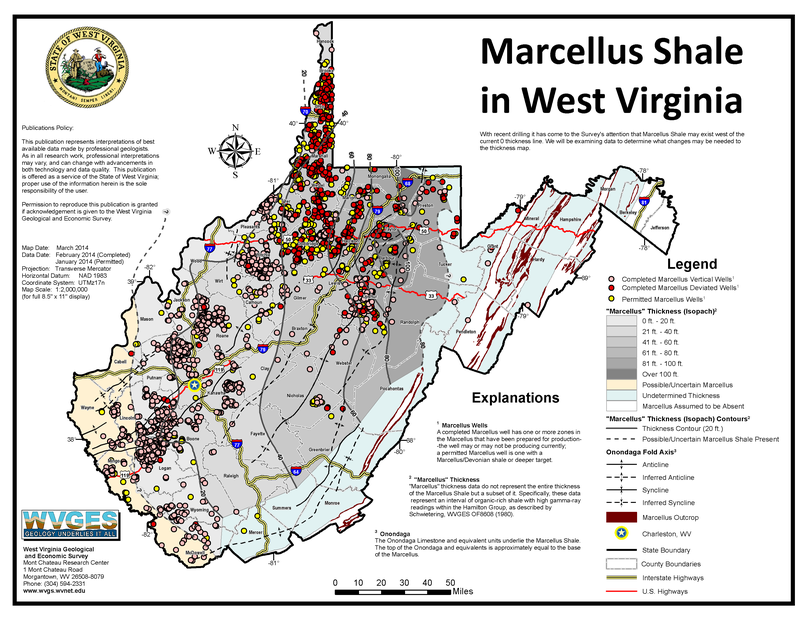 So I pulled a map from the WV Geological and Economic Survey to be able to compare. I worked on a story for the Monday paper, where I took a look at the number of concealed carry permits that were issued by the Kanawha County Sheriff since 2009. Rarely are permits rejected, only a little more than 2 percent of all permits since 2009 were turned down, and it’s even rarer for a permit to be revoked. The thing that jumped out at me the most though, was the huge surge in concealed carry permit applications in 2013. I racked my head to figure out what big mass shooting had happened that year and the first one that came to my mind was Sandy Hook. The Sandy Hook Massacre took place in December 2012, just a month before Obama gave his 2013 State of the Union address. President Barack Obama used that State of the Union address to call for stricter gun control laws, a call that became his platform until he issued his executive orders on the issue later that year. That legislative crusade led to people being afraid that Obama was going to take their guns, which led to an increase in sales and permit applications. In a cursory Google Trends search, I tried to figure out when people started worrying about whether or not Obama would take their guns. It turns out, the talk started in July 2012. According to Politifact.com, a fact checking site operated by the Tampa Bay Times, the NRA sent out a campaign mailer about why “Obama is coming for our guns” in June of 2012. Talk reached its peak in January 2013, according to the Google Search trends. That’s when Obama unveiled his legislative proposals for gun control to congress. So here’s an interactive I made to help explore these issues in a visual way. Keep an eye out for the story this Monday. Concealed Carry Permits in Kanawha County, W.V. Someone pointed out to me yesterday that I hadn’t made a map for the Congressional Race. Here it is. There’s a couple nifty features in this map. For one, you can type your city (I’d include a WV behind it) into the search bar and it’ll show you exactly where you are and who represents you (this helps in the Charleston area where four different districts collide). You can also make the map full screen to get a better look. Once again a * means incumbent. Since everyone in the House is up for reelection, the colors designate the offices of the incumbents. Purple means that there is a mix of Democrats and Republicans in office in that district. It’s been a long time since I’ve posted, but that’s because I’ve been working on making a map for the state senate and state delegate races. Here’s the finished product for the state senate race (I’m still working on the house version). I should explain. When there’s a star next to a person’s name, that means the person is the incumbent up for reelection. The color of the district is determined by the party of the incumbent who’s seat is up for reelection. Basically, you can hover over the area where you live and see who has filed to run. I’ll make an updated version after the primary. Stay tuned for the house version! I wanted to update the pre-candidacy list because Booth Goodwin’s filed to run for governor on January 1. Here’s the updated election guide. Taking a look at the data, this past year there were 14 homicides (not including this one, because we don’t know where it happened or who did it). 64 percent of those homicides involved guns. Another 21 percent involved knives. Of the homicides where the victims age was reported, the average age of the victims was 33 years old, with the oldest victim being 52 and the youngest 18. The average age of those charged with murder was 33.7, with the oldest being 59 and the youngest 18. This will be my final post for the Gazette-Mail data blog, which my colleague Dan Desrochers has wonderfully renamed, The 304. The data blog was a project that Dan and I talked about a lot over the past few months. This particular post was something we’d recently discussed and I decided to just go ahead and make it before I depart the paper (I’m heading to the Tennessean to cover the statehouse in Nashville). For the most part, I’ve had a wonderful time working here and was given the freedom to explore all things data-related and learn how to develop my skills while sharing information to you in a different way. Dan will do a better job than I and I look forward to continue to following his work. Anyways, I decided to embark on this insane adventure where I totaled up every single presidential and West Virginia gubernatorial election since 1952. I made this pretty spreadsheet based off the election returns I found on the West Virginia Secretary of State’s office. I did this in order to basically make these gifs, which I hope you’ll enjoy. Much appreciation goes out to Lisa Bernheim here at the Gazette-Mail, for her work in making the gifs possible. The is a gif of the results from every presidential election since 1952. And here’s a gif of the results from every gubernatorial race since 1952.